Before Chris Tomlin, Matt Redman, and Toby Mac there was Michael W. Smith. 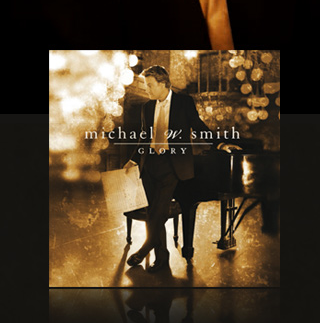 With classic hits such as “Agnus Dei”, “Great is the Lord”, and “Above All” Smith’s songs are now staples in virtually every evangelical church. He’s had over 25 years of music experience and his songs somehow have the ability to uplift and inspire. His lyrics have the ability to get to the heart of what we try to express in our relationship with our creator. The music veteran is known for two things: his silky smooth voice, and his exceptional piano playing ability. In his new album Glory, however, that iconic voice is missing. I had to skip ahead a couple of songs and re-read the press release before realizing that this was in fact an instrumental album. After getting over a bit of confusion I really started enjoying the album. This is a follow up to his 2000 RIAA Gold-selling instrumental album Freedom. Glory has a very full sound partially because it was recorded with a 65-piece orchestra at London’s prestigious AIR studios (the same studio where Andrew Lloyd Weber and Peter Gabriel recorded soundtracks to Pirates of the Caribbean and The Chronicles of Narnia). The album does have a very cinematic soundtrack. The opening “Glory Overture” is big and bold with smooth strings and strong trumpets. It also has a very Christmas-ey sound. As the album progresses with “Patriot”, you hear the striking tone of the french horn followed by very patriotic drumming. The familiar piano that holds the melody together is just enough of a friendly reminder to the listener that this is in fact a Michale W. Smith song. “Forever” takes us back to a more classic Smith sound. The track opening sounds as if it could be paired with lyrics to create another hit worship song. As the album reaches it’s sixth track the mood starts to shift to and things get a little more sombre in “Whittaker’s Wonder and “Joy follows Suffering”. Finally, the album closes with a beautiful rendition of Smith’s famous “Agnus Dei”. Overall, Glory is worth the purchase. It takes a classical genre and updates it a little for modern listeners. This album would be the perfect Christmas gift for a co-worker or the ideal soundtrack for background music at your annual Christmas party.